This story was filed by CBS Radio News correspondent Robert Berger in Jerusalem. Just days before Christmas, there has been a significant archaeological find in Jesus' hometown. 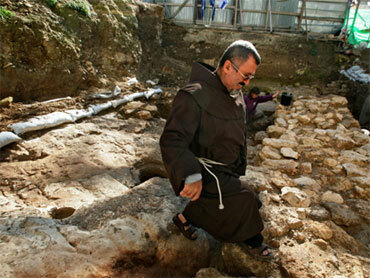 Israeli archaeologists say they've found the first house in Nazareth dating back to the time of Christ. "The character of the walls is typical of Jewish villages in the early Roman period. So this would be the sort of house that Jesus or people of his period would have lived in," said Yardena Alexandre of the Israel Antiquities Authority, who headed the excavation. Alexandre said the remains suggest that Nazareth was an out-of-the-way village of just 50 houses, covering only about four acres. Based on pottery shards found at the site, the house apparently belonged to a "simple Jewish family." The find was welcomed by local Arab Christians. "They say if the people do not speak, the stones will speak," said Father Jack Karam, a priest at the Basilica of the Annunciation, which marks the site where, according to Christian tradition, the Angel Gabriel appeared to the Virgin Mary and told her she would give birth to the Messiah. "This may well have been a place that Jesus and his contemporaries were familiar with," Alexandre said. Arab Christians, who are now outnumbered by Muslims in Nazareth, described the find as a "Christmas gift." Today, Nazareth is the largest Arab-majority city in northern Israel – where Muslims outnumber Christians two to one. Alexandre said that in Jesus' day, some 2,000 years ago, the entire population of the small hamlet would have been Jewish, and the locals constructed elaborate caves to hide from marauding Romans. The size and remoteness of Nazareth at the time, however, made the caves unnecessary in the end.